Part of the Studia Fennica Linguistica series. 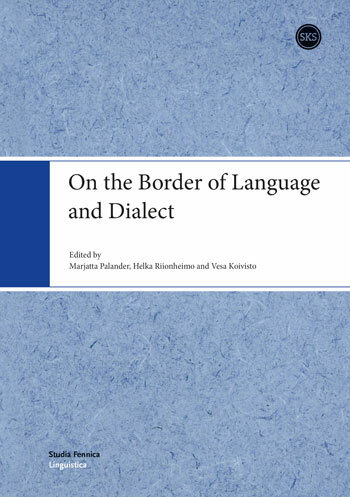 This volume considers the linguistic borders between languages and dia­lects, as well as the administrative, cultural and mental borders that reflect or affect linguistic ones; it comprises eight articles examining the mental borders between dialects, dialect continua and areas of mixed dialect, language ideologies, language mixing and contact-induced language change. The book opens with Dennis R. Preston’s review article on per­ceptual dialectology, showing how this field of study provides insights on laymen’s perceptions about dialect boundaries, and how such perceptions explain regional and social variation. Johanna Laakso problematizes the common notion of languages as having clear-cut boundaries and stresses the artificialness and conventionality of linguistic borders. Vesa Koivisto introduces the Border Karelian dialects as an example of language and dialect mixing. Marjatta Palander and Helka Riionheimo’s article examines the mental boundaries between Finnish and Karelian, demonstrated by the informants when recalling their fading memories of a lost mother tongue. Niina Kunnas focuses on how speakers of White Sea Karelian perceive the boundaries between their language and other varieties. Within the framework of language ideology, Tamás Péter Szabó highlights the ways in which linguistic borders are interactionally (co)constructed in the school environment in Hungary and Finland. Anna-Riitta Lindgren and Leena Niiranen present a contact-linguistic study investigating the vocabulary of Kven, a variety lying on the fuzzy boundary of a language and a dialect. Finally, Vesa Jarva and Jenni Mikkonen approach demographically manifested linguistic boundaries by examining the Old Helsinki slang, a mixture of lexical features derived from Finnish and Swedish. Together, the articles paint a picture of a multidimensional, multilingual, variable and ever-changing linguistic reality where diverse borders, boundaries and barriers meet, intertwine and cross each other. As a whole, the articles also seek to cross disciplinary and methodological boundaries and present new perspectives on earlier studies.